(Cornerstone R.A.S. / Skunk Records) Heraclitus once said that the hidden harmony is better than the obvious. The hidden harmony is celebrated in every note on this incredible release. 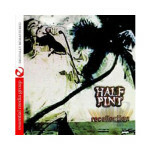 Half Pint is one of the most underrated reggae bands. Their songs are celebrations of life as well as examinations of victimization and oppression. “Recollection” is a collection of selected songs from the band’s discography.